Is this Memorial Day Weekend a good time to post what some may consider to be a controversial video presentation? Wars are begun by big bankers like the House of Rothschild. Massive government debt is used to finance such wars and create mega-profits for warmongers in houses of finance. Patriotic citizens are pawns in the war racket. So another Memorial Day is here and while you may disagree, it seems to me that honoring our soldiers and their families includes telling the truth about the corporatists who use them, then can hardly be bothered to fulfill the government's promises of top-tier medical care once the troops return home due to an underfunded, antiquated Veterans Administration full of scandals and fraud. 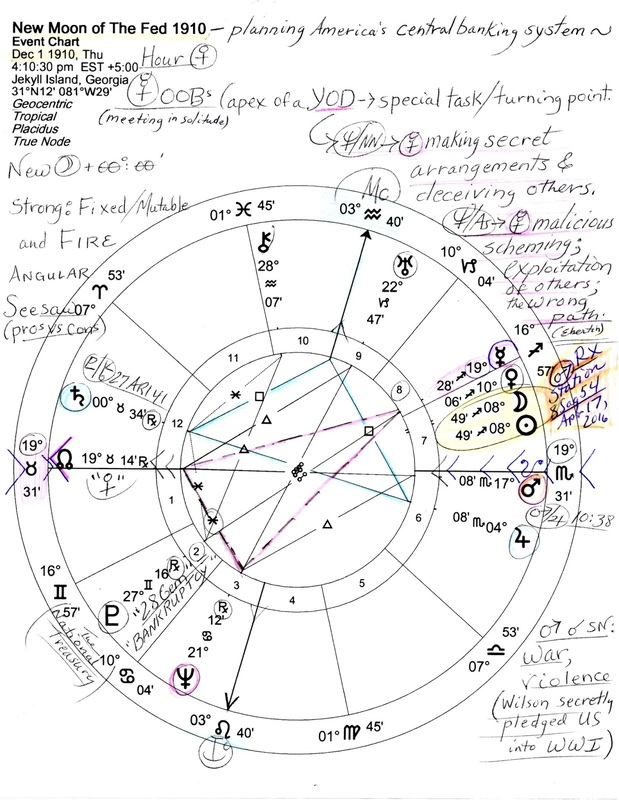 From behind the shadows of a darkened Moon, here is The Fed's New Moon of 1910 (tap or click for details; horoscope shown, below) which perfected during their secretive planning session on Jekyll Island, Georgia to surreptitiously work on "the Aldrich Plan" which led to the Federal Reserve Act of 1913, thus adding our nation finally to the octopus that is the corrupt global banking system. Enlarge to read notes such as the YOD pattern denoting a 'special task, crisis, and/or turning point' they addressed under the tutelage of German banker Paul Warburg who obviously felt not a shred of allegiance to the United States of America. 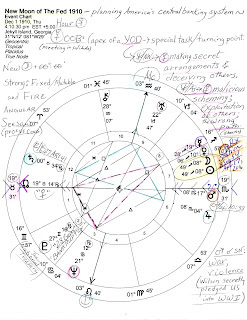 Solar Eclipse themes: B. Brady's Predictive Astrology.